Together with Julien Jacob one becomes a discoverer and adventurer in a new world. He inhabits a unique and incomparable country where a mysterious language – invented by himself – is spoken. It is a Celtic land over which an African sun shines. Sun-drenched and full of silence with long peaceful days, nights full of sagas and legends, a hot climate, whispering winds and a nature which takes one’s breath. In this unknown land one won’t find material wealth but spiritual richness. Sometimes his music is referred to as “folk”, crossed by African rhythms and melodies. Nevertheless it is still totally different from other African songs. The tracks are full of gentle shades and inventive, unexpected turns. Acoustic pop-arrangements and earthy sounds together with the deep and vibrating timbre of Julien Jacob’s voice are the framework of the impressing musical universe of his new album “Barham”. The title song is dedicated to his distant relatives who were sold as slaves. With his warm and deep voice he sings, murmurs and declaims his compositions. With soft melodies and tranquil tempi he conjures an almost meditative atmosphere for the listener. His enigmatic words are known to people all around the world from Sydney over Paris to New York, Berlin, Singapur or Montreal. 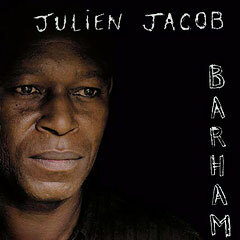 However, Julien Jacob does not explain what he tells in the twelve tracks of his new album “Barham”. The lyrics are composed in a self-invented language. It is up to the listener to open oneself to the atmosphere of the music and to find out which feelings are touched. Julien Jacob himself says that “This language came to me and was familiar like an own dialect ever after. With this language my voice can develop its very own potential: the free expression without pre-encoded words. This leads to more space for improvisation and my spiritual quest.”.